Sublette County Historical Society Parent organization of the Museum of the Mountain Man in Pinedale, Wyoming PO Box 909 700 E Hennick Ave Pinedale, WY 82941 307-367-4101 info@newforkpark.org DIRECTIONS FROM PINEDALE: The Park is located south of Pinedale and east of Big Piney, on the WEST side of the New Fork River. 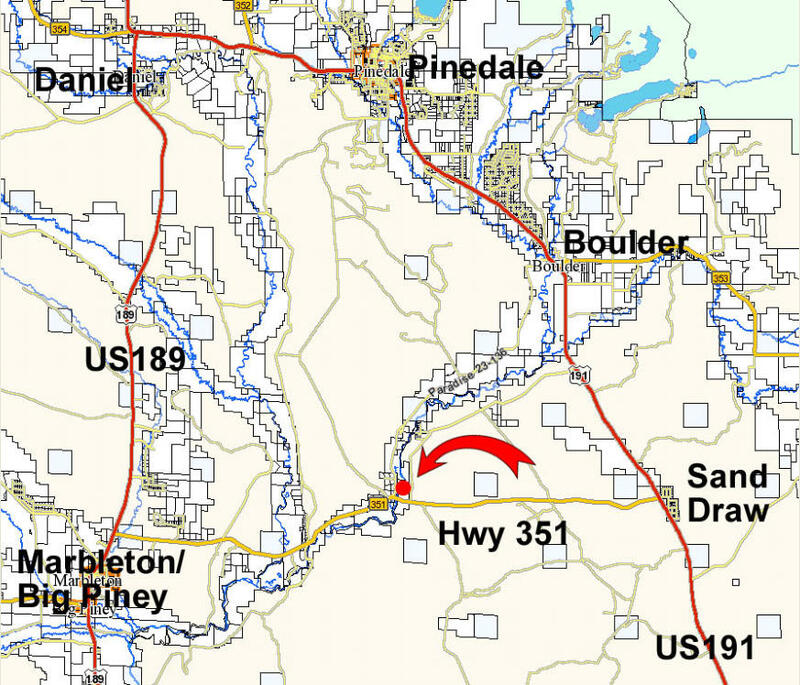 From Pinedale, take US 191 south 10 miles to Paradise Road (just north of Boulder), then travel south another 14 miles (if you get to Hwy 351, you’ve gone about a mile too far). The Park and parking area will be on your left. Park your vehicle and take the footpath into the Park. 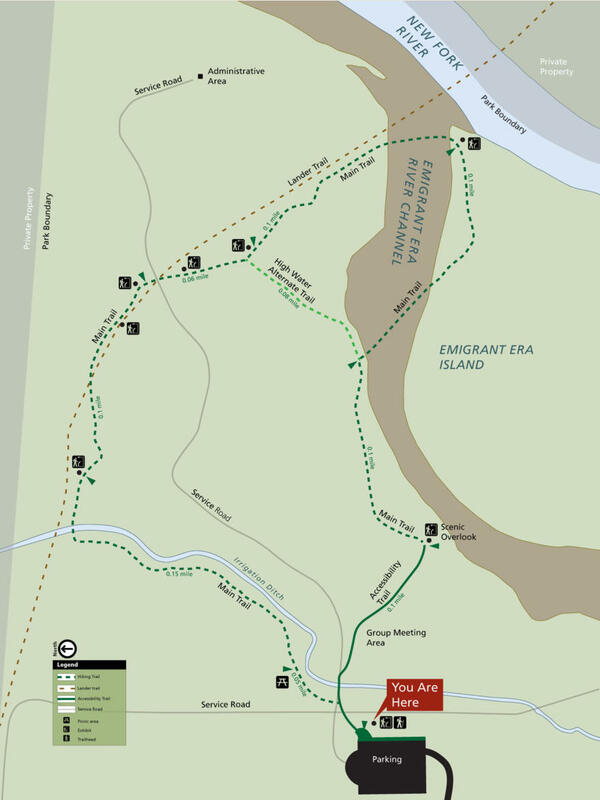 Note that by continuing south down Paradise road to Hwy 351, if you turn left (east) and travel about 1/8th of a mile there is a BLM campground on your left on the west side of the New Fork River (that is where the restrooms are.) 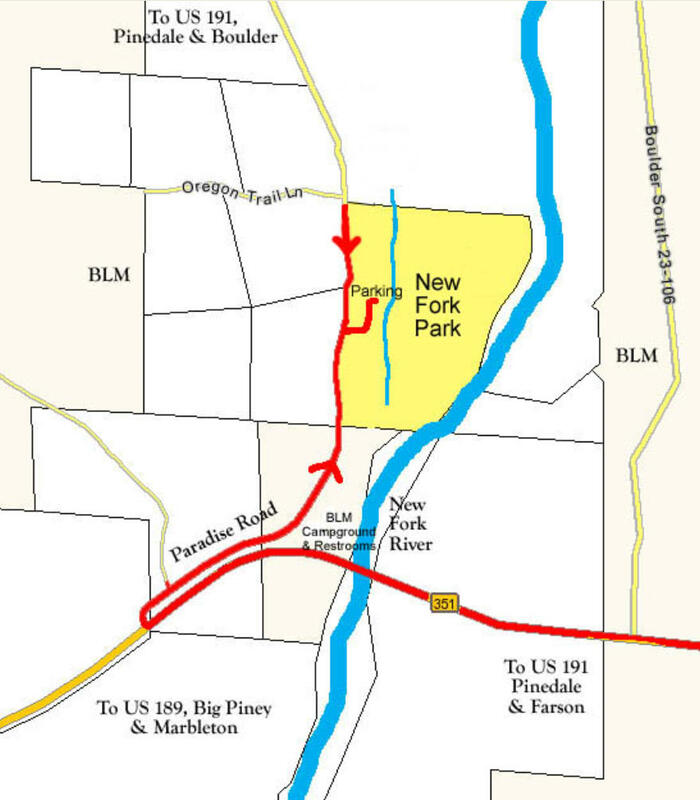 FROM BIG PINEY: The Park is located approximately 14 miles east from Big Piney/Marbleton on the WEST side of the New Fork River. From Big Piney, take Hwy 351 east approximately 11 miles. Take Paradise road (just before crossing the New Fork River), and travel north approximately 1 mile. The Park parking area will be on your right. Park your vehicle and take the footpath into the Park. Note, just prior to turning onto Paraise Road a little further down the way on Hwy 351 there is a BLM campground on your left before crossing the New Fork River bridge (that is where the restrooms are.) FROM ROCK SPRINGS: Take US 191 north. At the Hwy 351 cutoff junction go left (west) towards Big Piney. Travel about 10 miles and cross the New Fork River bridge to get to the WEST side of the river. Approximately 1/8 mile after crossing the New Fork River, take the paved Paradise road to your right. Travel north approximately 1 mile. The Park and parking lot entrance will be on your right. Park your vehicle and take the footpath into the Park. (note the BLM campground on your right just after crossing the New Fork River bridge on Hwy 351, that is where the restrooms are.